"My Druid is Christ, the son of God..."
Celtic christianity and spirituality are irrevocably bound to the early Celtic Christian saints of Ireland and Scotland. I looked up the word "peregrine" in my handy Webster's Collegiate, since the Irish evangelist monks referred to themselves as "Peregrinari Pro Christ" (pilgrims for Christ). The meaning was short and sweet: "having a tendency to wander." My mind then wandered through various notions about journeying and the word peregrine (I always think of soaring falcons), but soon landed on a much more prosaic Peregrine, better known as "Pippin" Took, companion of Frodo Baggins on his journey to destroy the Ring. Now Frodo did not want to leave his home; the Shire was green, the ale was strong, the food was plenteous, and to sit by the fire, reading and studying, made for a very pleasant life. But he had to go. Just as St. Patrick was called to return to the place of his slavery, St. Ninian called to evangelize the Scots of Galloway, and St. Brendan called to cast off in his small boat and end up in Iceland bringing the light of Christ to the Norse. St. Columba, too, was forced to move by evil circumstance, leaving the monasteries he had established in northern Ireland for a rocky, yew-covered isle we call Iona. The Celtic monks called their peregrinations the "White Martyrdom". White, because their blood was not shed (though that could and did happen), and martyrdom, because they had to leave their beloved home. Their belief was that the spiritual journey of our lives demands both outward and inward wandering, often not knowing where God will lead. The Celts had wandered all across Europe before landing on its western fringes. They knew what it meant to pick up your feet and go. It is said that St. Aidan progressed around his diocese on foot, never on horseback except in case of emergency. When you travel afoot, you see the land, the sky, the water, and the people. Knowing the dangers that awaited, Frodo had planned to travel alone. But that is not the Celtic way, for we are not meant to travel alone but in companionship and in community. Everyone requires a special friend, what the Irish and Scots called a "soul friend" or anam cara, to help us in our spiritual journey. In ancient times, it was not necessary or even usual for the anam cara to be a priest or someone "more spiritual" than oneself. Rather, this was a relationship in which spiritual insights, growth, and difficulties were shared with honesty and good advice both taken and given. Sometimes, a soul friend is required to take harsh action to keep us on the true path. We know what Sam Gamgee endured for Frodo and we know the pain it caused him. We also know what he ultimately gained. St. Brigid reputedly said, "a person without a soul friend is like a body without a head." I would like to have the three Marys, their fame is so great. I would like to have Jesus too here amongst them. I would like to be watching Heaven's family, drinking it through all eternity. Eventually, Frodo and Sam are joined in their fellowship by seven companions, making nine in all. Each of them highlights in their own ways the best (and sometimes worst) of Celtic culture. In addition to his anam cara and his kin, Frodo is joined by mighty, fearsome warriors, Aragorn and Boromir. Both are great men, noble and fine, but only one stays the course. St. Columba is an example of a warrior monk, admired not only for his spiritual leadership, but his physical vigor. Irish and Scots monasteries were communities (townships) which had to defend themselves and sometimes even warred amongst themselves. Courage and phsyical prowess have always been highly prized among the Celts. Gimli the dwarf and his ilk exemplify the incomparable achievements of Celtic art and metalworking, the reverence with which the Celtic Christians created beauty to glorify God. Old Bilbo did not go on the journey; rather, he stayed secluded and completed his book. Love for learning and a meticulous recording of both Irish myth and the classic Greek and Latin texts have given the Irish/Scots the well-deserved accolade of "saviors of civilization" during the so-called Dark Ages (the golden age of Celtic Christianity). The Book of Kells and the Lindisfarne Gospels are the prime examples of this achievement. When the druid religion gave way before Christianity, many elements of druid belief were incorporated into the Celtic Christian worldview. One of the most significant is the belief in the Otherworld - the place where our spirit flies and the place where the faeries live. For the druids, the line between worlds was thin and the Otherworld was as real as the one we physically inhabit. This notion was incorporated into Celtic Christianity in a very beautiful way. As we've said, community is vital to the Gaels. But community doesn't begin or end with those who are presently living amongst us. Rather, our relationships span all time and space, making the saints who've gone before completely accessible to us -- willing to care, to share and to guide in a very real and personal way. Legolas the Elf joins Frodo's band, bringing with him the druidic love for and deep understanding of nature and her ways. He and Gimli become soul friends, each finding their mirror in one another and, eventually, sharing the journey to the Otherworld. Throughout Frodo's travels, he is guided and counseled by the immortal elves, particularly Galadriel. In Celtic spirituality we are never alone in our journey, but have everpresent and immanent support from angels and saints, and most especially from Mary, Mother of God. Celtic culture has always respected the wisdom of women. It is said that St. Brigid counseled kings and ruled as abbess over men and women both. While many monks and nuns chose celibacy, it was not required and many priests married (at least prior to Roman ascendancy). Also, many laymen and laywomen lived in monastic communities, their dedication and spiritual contributions recognized and respected. Frodo had one final companion when he set off with the ring - a druid named Gandalf the Grey. There are likely dozens of people who've written books and articles dealing with the symbolism of Gandalf, but I'll share my own observations, based not on scholarship, but on my many readings of the books and my own heart. Gandalf walked the dusty roads of Middle Earth, protecting, healing, teaching. He was a peregrinari of the first order. He was a wizard and performed miracles. He knew the dangers and possibilities of true sight and sought not the gift for his own benefit. He flew on eagle's wings, just as ancient druids saw through the eyes of birds. He endured the fire and was recast as Gandalf the White. He was powerful, wise and mighty. He was the servant of good. He was the agent through which the will of the Word was made manifest to Frodo. Yet, he was not the bearer of the Ring. The Celtic peoples live on the fringes of the world, just as the Shire lay on the fringes of Middle Earth. In the early centuries of the first millenium the western world was awash in war and chaos and civilization seemed to retreat to the distant environs of Byzantium far, far away. Yet, a small trickle of simply robed men appeared, first two Britons, Ninian going to Galloway in southern Scotland, and then Patrick returning to northern Ireland. From Ireland the trickle grew, sending men like Columba, Aidan, Brendan, Columban, and many more. With dusty feet and a few companions, these men walked the paths of Scotland, northern England, France, Switzerland, Germany, Italy, and as far away as Iceland, ministering to the poor, establishing monasteries, spreading education, preserving knowledge, and being Christ in this world. Most did not know where they were headed when their journey began, nor what hardships they might endure along the way. They traveled light, trusting in providence to provide for their needs and trusting God to take them where they were to go. It is the pilgrimage itself that defines who we are; the journey is the purifying fire. God alone determines where, when, and how that journey ends. What we offer to God is our willingness to step out onto the path and start walking. Or, as Frodo said, "I will take the Ring, though I do not know the way." Some of the characteristics of Celtic Christianity and spirituality discussed here include community, spiritual friendship, life as a pilgrimage (and actual pilgrimage), family loyalty, the intimate communion of saints both living and dead, the immanence of the spiritual world, the goodness of nature, hospitality, and contentment in simplicity. There are many others, as well, most particularly contemplation. 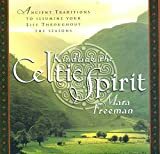 If these ideas speak to your heart, you can find a few good books at Celtic Christianity that might help you start to make more of your spiritual journey. For the most beautiful translation I have found of St. Patrick's famous hymn, the Lorica (Deer's Cry), please visit http://justus.anglican.org/resources/bio/124.html. The patron saint of Scotland is St. Andrew. The legend has it that St. Rule received instructions in a vision to remove some of the saints' relics from Constantinople to the ends of the earth for safekeeping. So he brought them to Scotland! Specifically, the present-day site of St. Andrews. You would think that none of this has anything to do with Celtic Christianity, but God moves in mysterious ways. St. Andrew is only featured individually three times in the gospels. Each time, he is seen bringing someone to Christ - his brother Peter, a child (the boy with the fish and bread), and some Greeks. Here in a nutshell is the ministry of the Irish and Scots monks - bring your brother, feed the poor, convert the pagan. Beautiful exploration of Celtic Christianity and how its spiritual disciplines can help us experience God in new and everpresent ways. Inspiring stories of the Celtic saints sharing how they were able to see God's presence in everyone and everything. 5 stars. Monastic prayers and praises, litanies and more from the Irish and Welsh traditions. O'Donohue talks to us about our need for belonging and our yearning to be a part of something beyond ourselves. It may be read as a book about "home" and what that concept means. Ms. de Waal has written many lovely books, particularly on prayer, and leads retreats and pilgrimages to sacred places in the Scottish Isles. This is an outstanding and extremely readable introduction to all aspects of Celtic christianity. The real deal on original sources - St. Patrick (in his own words), St. Brigid, St. Brendan, St. Columba - all the ancient references and texts, including prayers and poems. Newell's manifesto for change through unity based in Celtic Christian teachings in the face of global conflicts and challenges.